Part of Jammu and Kashmir , Ladakh is the third division. Each of the divisions, Jammu , Kashmir and Ladakh, has distinct cultures geographical terrain, religion and life style. It is often called "LITTLE TIBET". 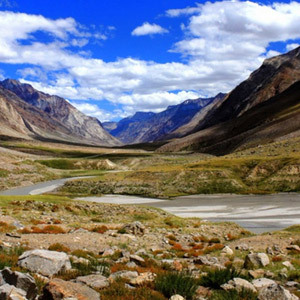 Ladakh derives its name from Tibetan "La Tags' the land of high pass. Ladakh in the western Himalayas from the vast Tibetan plateau, a high altitude desert, Karakoram Ladakh and Zanaskar range. Ladakh is divided administratively into 2 districts Kargil and Leh. 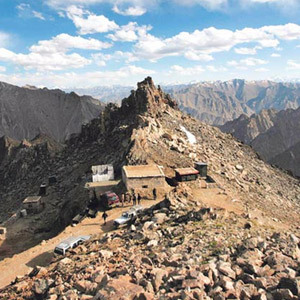 The Landscape of Ladakh is adventurous, Barren Mountain. The altitude ranges from 9000ft to 24,000ft from Sea level. Atmosphere is generally dry. Great Himalaya Range. Including the impressive Snowcapped peaks, NUN and KUN 7135 and 7087mtrs the highest peaks in the Kashmir Himalaya., the Zanaskar range to the south and the Indus Valley to the North. North Ladakh range, the NUBRA and Shyok rivers drain the huge peaks of the eastern Karakoram, Rimo 7385mtrs, Teran Kangri 7464 mtrs. In the south east of Ladakh there are several Lakes PANGONG TSO, which forms the border with Tibet and TSO MORIRI TSO KAR. The highest peaks around TSO MORIRI is_Lungser Kangri 6655 m, Chhasser Kangri 6622 m and Lapgo 6405 m.
Ladakh has extensive potential for adventure such a MOUNTAINEERING,TREKKING, RAFTING, MOUNTAIN BIKING and so on. All major flights daily operates from Delhi ,two flights twice in a week from Jammu and One flight from Srinagar on Wed. Airport is 7 kms from City. ON ARRIVAL LEH BY AIR ONE MUST REST FOR AT LEAST 24 HOURS. Even locals follow this rule. 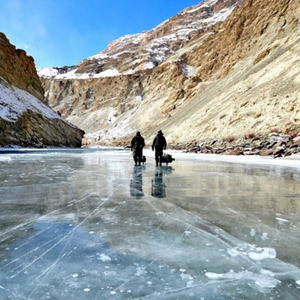 The temperature in Ladakh are extreme , air can be very dry, sun is strong, it is best to keep covered. Nights will be cold. 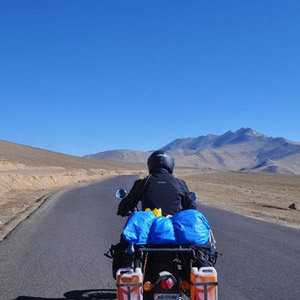 434 kms metal top road from Srinagar to Leh with overnight stop at KARGIL, which is 204 kms from Srinagar, passing over Zojila Pass 3474 mtrs and from Kargil to Leh two passes Namika La pass 3729 mtrs and Fatu La pass 4100mts. Road remains open from 15 May to October. 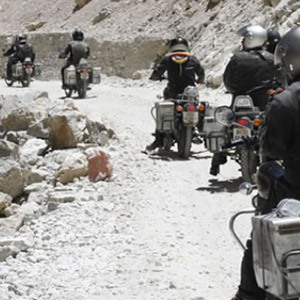 Major villages on this routes are Sonamarg, Drass, Kargil, Mulbekh, Lamayuru, Khalsi, Saspol and Nimu.Another route to Leh is from Manali (Himachal Pradesh) 473 kms open from 15 July to end September. 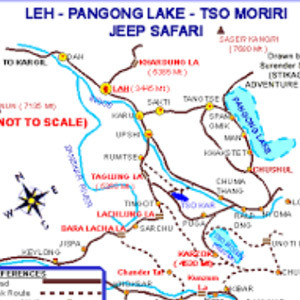 The journey takes two days.LOCAL TRANSPORT: Plenty of Taxis with good conditions and latest models like; Tata Sumo/ Quails/ Ambassador / Scorpio/ Innova. 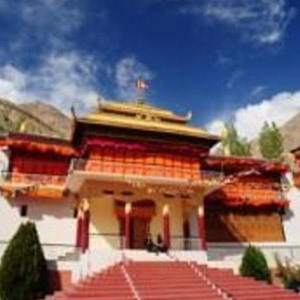 ACCOMODATION: There are abundance Hotels and Guest Houses in and around Leh with attached bath..
All four Buddhist Sects are represented by Monastery in Ladakh from the oldest NYINGMAPA Sect and the DROKHPA and SARKYAPA ones to the most recent (16th century) and widely represented sect, the GELUGSPA. 4: Chadar Ice Trek (in winter) : On frozen river Zanaskar from Nimaling 405 Kms drive from Leh and 8 Days Trek to Padum Zanaskar season only in Feb.
3: Kang Yatze 3 days (on markha Trek route) Season June to Sep.
For Expeditions climbing permit to apply Indian Mountaineering Foundation, New Delhi. Tso- Mori-Ri lake. Season June end to late Sep.
District headquaters of the region of Suru, Drass Wakha, Badh Karbu and Zanaskar. Lies midway between the alpine valley of Kashmir 204 Kms from Srinagar via Zogila Pass and Drass and from Leh 234 kms via Lamayuru, Fatula Pass 4100mtrs and Namikala Pass_____ . This is where all Vehicles going between these two places make a night halt. 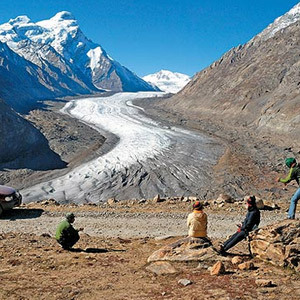 For Tourist Kargil is mainly a transit point between Srinagar – Leh and to Zanaskar. The people of Kargil are mostly Shia Muslims. Kargil next roaring Suru river. In the past until 1947, it was an important trading Center linking with Ladakh, Tibet, Yarkand, Gilgit, Zanaskar. 235kms from Kargil 9 to 10 hours journey. Spectacular valley, nestling in the main range of Himalayas. Passing through beautiful village Sanku, Panikhar , trek route to Pahalgam , Tangol –(Base camps for Nun Expeditions) Parkachika Village last Muslim village. Large flocks of the Bakarwal (Shipyards) from the Jammu hills stay around Gulmatongo – Base camps to stay here during summer Kun because of alpine pastures . Famous For: Long trek and Tours in the region also famous Monasteries around Padum. Accommodation Few hotels and Guest houses. 1: Padam- Phuktal- Shadi-Thondge-max altitude 5400mtrs Grade Moderate+Strenuous 7 days Season July 15 to sep.
3: Rangdum – Lamayuru: 5days max altitude 5200mtrs Grade Moderate + Strenuous Season (Aug- Sep). 4: Padam-Sarchu : 10 days max Altitude 5400mtrs Grade Moderate + Strenous. Season (July-Sep). 5: Padam (Tingri) to Kishtwar max Altitude 5800mtrs Grade Moderate Strenuous 7 days trek. Season (July end to Sep). 1: KUN Expedition ( 18 days) base to Base 7085 mtrs. 2: NUN Expedition 18 days Base to Base camp 7135 Mtrs. Climbing permission to get from Indian Mountaineering Foundation New Delhi. Note: Visitors have a duty to ensure all rubbish is carried out.